Well I fell of the wagon yet again. 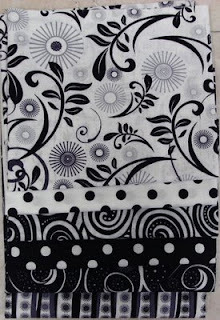 Had to go to my LQS to pick up some quilts I had in there and saw this divine pack of Black & Whites. Well, it's only a LITTLE pack and it will get used as I will be making a few B & W quilts this year. So had a little stumble on my FAD - Fabric Addict Diet, but considering my past I think I'm doing pretty good. Not much sewing getting done around here at the moment so, when I should have been doing something else today, I rebelled and did a little on the B & W quilt. After I took this photo I realised some of the sewing together would be a bit tricky. And this is a throw together fun quilt so I didn't want to think too much so re-arranged bits to make it easier. I'm on several ....AD's this year. I have my FAD - Fabric Addict Diet, my GAD - Gadget Addict Diet and my BAD - Book Addict Diet. This arrive in the mail recently but as I ordered and paid for it last October I don't think it counts. 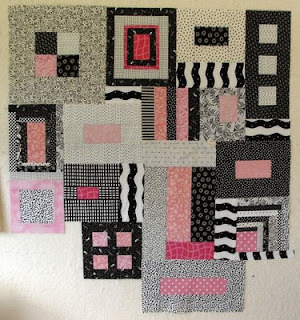 hey I love the arrangement of the black/white/pink quilt - very original. heyy...what an awesome pink-B&W you had made, I really love it, love the color, the pattern, all of them. I'll wait for your next picture of it after finished. Love your black, white and pink blocks! They will make a great quilt. I thought FAD stood for Fabric Acquisition Disorder! I have that, but don't tell anyone! Maggie I am soooo waiting for my book to arrive, I hope it is soon. That looks like a really cool book. I hope it shows up in the US. I have been waiting to buy this book here in the US for weeks. they are trying to figure out a way to get them here without it costing so much for the postage! do you love the book or what? any patterns your excited about making? 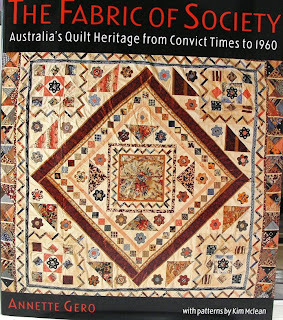 antique quilts to die for?